A few months ago when Queenie the last of our original pet hens passed away, she left behind her a best friend. Now this best friend had lived with her from being just days old and spent most of the hours in every day following her around the farmyard. They were most definitely like chalk and cheese, with Queenie being the complete lady, very well behaved and loved the attention from anyone who came to visit, but Rita on the other hand was a total nightmare, well most of the time anyway. Nobody could get close enough to her to stroke her, she was the one who would be in the thick of any trouble in the farmyard, whether she should have been involved or not and she was unsurprisingly always the last to get herself off to bed each evening. So why am I telling you this? Well, basically because with Rita there has been a transformation and she has definitely turned over a new leaf. If I didn’t know better, I would have said that Queenie, upon her death bed had taken it upon herself to have a little word with Rita, to enlighten her as to the benefits of playing ball with these human folk that she lives amongst, as the result of doing so were great. 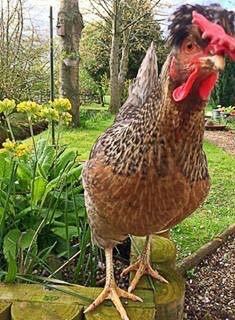 Before her good friend was even cold, Rita was like a new hen! Rather than charging around the place at great speed for most of the day, she has taken it upon herself to take her time and has very quickly seen the benefits of doing so. Staff and visitors will feed her, will spend time with her and give her attention, which she never had before. She now knows that being nice to people pays dividends far more than pecking at people and being stand offish and antisocial. She is now a pleasure to have on the farm and I’m sure another benefit of her behavioural turn around is that she is laying far more of her beautiful blue eggs than she ever did before, which is great. So, long may this reformed Rita continue in the same way and maybe I should get her to have a word with a few of our other residents about behaviour too, with the goats being first on that list. You see after moving them into their new surroundings a couple of weeks ago, they very quickly settled in, but then decided that they would do a little renovating and remodelling around the place. Picture the scene, very tall, but over hanging white poplars line along the front side of their home with chestnuts and oaks along the back so they have plenty of shade for those far too few sunny days. They also have probably twenty bushes or trees in there also to break things up a little and add variety to their landscape…well that’s what I thought. It appears that Stacey and Bambi didn’t agree with my thinking on that and have promptly taken it upon themselves to decimate every single one of them. Apparently my goats love these bushes and trees as much as me, but I loved to look at them whereas they love to eat them. Every single bush or tree has had each branch systematically stripped of leaves from earth to my shoulder height, which is as far up as they can reach on their tip toes. I have since pruned everything back, so at least it looks better and hopefully it will put an end to their tree ruining days for the foreseeable future.